Editor: If that title looks familiar, then you must be a long time reader. But, it occurred to me just this morning, answering an e-mail from a reader, that since we get new followers every day and since we have now posted 7,624 articles here at RRW, that maybe re-posting some of those from time to time might be useful. I do want to remind you that the search function here at RRW is very good, so please use it! (Upper left hand side bar) You might first search for your city or state and see if we have written about it previously. Since the Obama Administration is in crunch time to get as many refugees (especially the Syrians) seeded into your towns as they can, I thought this post from March 2015 would be useful. Changing America by changing the people. President Barack Obama, flanked by Cecilia Muñoz, director of the White House Domestic Policy Council, left, and senior White House adviser Valerie Jarrett are changing the people by ‘planting’ immigrant “seedlings” in towns across America! But, I realized yesterday, while thinking about the newest proposed seed community*** in Rep. Trey Gowdy’s backyard in Spartanburg, SC, that we needed a quick primer on what elected officials and citizens should know if they are being pressured to ‘welcome the stranger‘ (this guilt-tripping language is one way they pressure your town!). Update: Gowdy lost, assuming he ever tried, and Spartanburg is now an established resettlement site. So here are my Ten Things you need to know! 1) In most cases, the United Nations is choosing our refugees. Topping the list right now are Iraqis, Burmese, Congolese, Somalis and Bhutanese. The UN is pressuring the US to take a large number, 10,000 or so, Syrians. We are bringing in refugees from countries which hate us. Your town does not get to choose who you get! You will receive racially, culturally and religiously diverse people, usually very different from your local population and very different from each other. That old ‘melting pot’ concept is dead because the numbers are too high. 2) Often the US State Department’s chosen resettlement contractor for your town, sounds like a church group, or other benign-sounding non-profit. They may have a religious-sounding name, but know that they are being paid by the head from the federal treasury to bring refugees to your town. It is not the case that they are passing a plate on Sunday morning to pay for this very expensive program. Here are the nine major contractors which have 350 subcontractors working for them (headquartered in over 180 cities so far). 3) The contractor’s job is to get the refugee family their “services.” That means they hold the refugees’ hands until they are settled usually in tax-payer subsidized housing, get them signed up for most forms of welfare including food stamps and other cash assistance, sign them up for health care and enroll the kids in school. This special class of legal immigrant is entitled to welfare! The contractor is also paid with your tax dollars to give refugees job counseling and training. The contractor may also be working closely with some big business (and the Chamber of Commerce) nearby which is looking for cheap labor. 4) The contractor’s job ends in 3-6 months at which point they move on to bringing in the next fresh group of “clients,” often the relatives of the first group. Earlier, and still struggling, refugees are left in the care of your social services department. At this point the contractors are entrenched in your town and will call you racists, rednecks and xenophobes if your citizens want to slow the flow. 5) Your town will never get out of the program once the contractor has an office set up and staff to pay. Many cities are trying to get out now and can’t: Manchester, NH, Springfield and Lynn, Mass, Amarillo, TX come to mind. Because there have developed “pockets of resistance” (their words), the State Department is desperately out scouting for fresh territory. 7) Refugees are permitted entry into the US with HIV/AIDS and Tuberculosis among other medical problems. Physical and mental health challenges will most likely overburden your local health department. 8) Your local government is responsible (Clinton-era Executive Order) for providing costly interpreters for the myriad languages being spoken in the school system, the health system and the criminal justice system should problems arise. 9) Refugees who do find work, work at entry level jobs and minimum wage so they will still be able to benefit from many welfare programs open to low-income Americans. Elder refugees are eligible for SSI. The refugees are Legal Permanent Residents and can begin the citizenship process quickly. 10) If they say they are coming to your town with the first group of refugees, there is only one thing you can do! ASK QUESTIONS IN PUBLIC. Demand that your elected officials get involved. Demand that a community meeting be held, for the US State Department, the Office of Refugee Resettlement (in HHS), your state refugee office (if there is one) and their contractors, to answer questions from the citizens of the town or city. Get your Member of Congress and US Senators involved too! Don’t forget your state legislators! The State Department and its contractors HATE to answer questions! Tell your local elected officials you want a public hearing! Tell your elected officials that you want the federal government and its contractors to provide a plan! You want them to answer questions such as these below. Remember you have every right to know what is being planned for your town. They will bully you, call you names and say you can’t stop them anyway, but refuse to be bullied! Who is coming? From where and how many? Will they stop the resettlement if the town is becoming economically or socially stressed? What security and health screening have the refugees undergone? How many will come each year? Who is paying for their health care? Who is paying to educate the children who don’t speak English and may never have attended school? Does your town have an adequate supply of government-supported housing? Will demands for housing crowd out American elderly, poor or disabled citizens? Where will they work? Do we have high unemployment already? I’m sure you can think of others. After getting answers (good luck!) and having a vigorous public discussion, then your town can decide based on all the facts whether you will eagerly “welcome” New Americans to your community, or not. Endnote: There are other refugee experts in the country, so let me know if I’m missing anything here and I’ll add it! Update!!! Call this #11: an experienced researcher just reminded me that concerned citizens must form a citizens’ group to research the structure of the program in your state to obtain the FISCAL and legal facts about the program as the structure can vary from state to state. *** This post (on Spartanburg) brought in the highest number of readers we have ever had for one post over a brief two days! An afterthought: If you should get a public meeting/hearing be sure to educate yourselves on the Delphi Technique, a strategy often used by government agencies wishing to control the outcome of a meeting. Go here to see what Judy said about it in advance of the public meeting held in Hagerstown, MD in September 2007. The US State Department has said they won’t go where they are not wanted, but they are desperate now (too many refugees coming in and too few ‘welcoming’ towns) and are shoving refugees down the throats of reluctant communities, but you still mustn’t roll over and give up! You do have a right to determine the character of your community and how your tax dollars are spent, so continue to speak up. Thank God, we aren’t Europe yet! As the November elections approach make this issue a top priority whenever you have an opportunity to meet candidates at all levels of government. You can be sure if Hillary Clinton is elected President this program will never be reformed, but will be put on steroids. So, how do you find out and what do you do? And, unfortunately I am going away for a few days and will be woefully behind in my blogging by early next week. I urge all of you to follow my twitter feed in the right hand side bar here at RRW or at American Resistance 2016! because I hope to keep up somewhat in getting news to you that way. Or, follow me directly on twitter @RefugeeWatcher. It occurred to me in the last 24 hours, after writing about Ithaca, NY that I should do a summary post about where to find things if you get wind that your town is targeted as a new resettlement site (they are wearing out their welcome in many existing sites! ), or, if you are in an existing site and have just figured that out! The Obama Administration is looking to resettle 85,000 or more refugees this year from around the world and for Obama’s last opportunity to submit a proposal, he is aiming for 100,000 in FY2017. Go here for a list of the nine major federal resettlement contractors. Go here to find out if your city is already a major resettlement site, and see who the federal contractors and subcontractors are who are seeding your town or city. Go here to see the existing resettlement sites on a US map. Remember your town is fair-game if it is within 100 miles of any of these offices. Go here for a list of the state refugee coordinators. Call yours and ask if new towns are being chosen. Go here to learn about the R & P Abstracts that must be prepared for each resettlement site by the subcontractor each year. Call the contractor/subcontractor in your city (see list) and ask for the recent ones for your town including the one for FY2016. You will learn from that document how many are coming and what amenities your town is offering. Be prepared to be stone-walled. They want to keep all this secret from taxpaying citizens and will try to tell you to use the Freedom of Information Act to obtain it—that should not be necessary, they just want to make you go away. Tell your city/county elected officials that they must get this document. They probably won’t dare turn down an elected official. Go here to see the most recent Annual Report to Congress from the Office of Refuge Resettlement. It is a treasure-trove of information especially useful to see how high the welfare use of refugees is. Go here for the most recent “Key Indicators” for refugee resettlement, another great source of information about especially refugee employment (unemployment!) etc. And, last, but not least, search our archives of over 7,000 posts by typing a few key words into our search window! So, again, if you don’t see many posts in the next few days, know that I’m traveling! But, you have plenty of homework above to keep you busy! House immigration subcommittee set to mark-up refugee reform bill tomorrow; why now? It is my duty to report on this bill being championed by Idaho Rep. Raul Labrador (R-Idaho) and Judiciary Chairman Bob Goodlatte, but sorry I can’t get too excited about it. And, although he is apparently a co-sponsor, why isn’t Subcommittee Chairman Trey Gowdy (bff Open borders Marco) leading this effort? Hmmm…..
McConnell and Ryan. Would we be better off with these two deciding how many refugees are admitted to the US in the coming years? I’m still advocating for a complete shutdown of the whole refugee resettlement apparatus! Here is the press release from the House Judiciary Committee announcing the mark-up of a bill that will likely go nowhere. I could be wrong, but at this late stage in the legislative calendar and with an election coming up in November, call me a cynic! Does the Committee want to make sure that the earlier Babin bill (which would temporarily halt the program altogether) is squashed? And, let me ask you, do we really want this particular pro-donor class (big business establishment/Chamber of Commerce) Republican leadership making the determination about how many refugees are admitted anymore than say a Trump White House? Do you trust Rep. Paul Ryan and Senator Mitch (bring’em to Kentucky) McConnell to set levels? By offering fig leaves, are they attempting to save the whole program which in my view (after 8 years of following this) needs to be completely trashed! And, does this bill do anything to disrupt the flow of billions of taxpayer dollars to unaccountable ‘religious’ non-profits who really call the shots on who is resettled where in America? Someone correct me, does it do anything to give them all the heave-ho? Again, sorry to sound so cynical. I am open to someone convincing me that this is going to do anything (other than attempt to quiet the angry masses). Oops! There is one thing it does for sure. It causes the Open borders left and the Refugee Contractors (organized by their lobbying arm, Refugee Council USA) to go to their grassroots and fire them up once again, see here. I enjoy seeing them aggravated, but does stirring them up in this critical election year with a bill going nowhere really help us? Go here to see the press release (thanks to all who sent it!). That said, by all means though follow the lead of groups like NumbersUSA pushing for you to contact your members of Congress. You do want them to know that the issue is one that motivates and angers you! Update: It appears the last time either Judiciary Committee held required hearings on the annual refugee consultation was in 1999 (here). If anyone can find a more recent hearing record, please send it. Why haven’t they been doing their jobs? We’ve been aware for several years that the Administration each September must consult with the House and Senate Judiciary Committees on the President’s refugee resettlement plan for the upcoming year which must lay out how many refugees we will take, from where they will come, and why this is in our national interest. Reports I’ve received over the years are that the Committees responsible for “consulting” don’t change anything the President requests. I could be wrong, but at least in the 8 years I’ve followed the Refugee Admissions Program, the consultation and the required delivery of a lengthy report amounted to no more than State Department reps dropping off the report with committee staff. (I want to be corrected if there has been much more than that over the last decade!). According to a press release from Senator Charles Grassley’s office, Obama Sec. of State John Kerry and Asst. Sec. Anne Richard intimated that Obama might “open the floodgates” and use emergency authority to go beyond the number the Administration was proposing this week which is 10,000 Syrians for American towns this coming fiscal year. On Wednesday, Sec. of State John Kerry and Asst. Secretary of State Anne Richard made a trip to the Hill to meet with Senators Grassley and Sessions (others?) where they discussed the 10,000 (some reports say 5,000) Syrians for FY2016 proposal. They are calling that meeting a “consultation.” Were Members of the House Judiciary Committee present as the law requires? This is what the Office of Senate Judiciary Chairman Charles Grassley said after the meeting with Kerry. It appears that Kerry left the door open for a much larger number of Syrians than the 10,000 being mentioned by the Administration so far. Senate Judiciary Committee Chairman Chuck Grassley made the following statement after a meeting with Secretary of State John Kerry and Anne Richard, Assistant Secretary for Population, Refugees and Migration. The consultation regarding the number of refugees that the United States will admit into the country is required by law. In the event of an “emergency refugee situation” the administration may admit an additional number of refugees, but only after additional consultation with Congress. “Secretary Kerry initially said that the Obama administration is seeking a reasonable increase in refugees allowed into the United States in the upcoming fiscal year. But when pressed, the administration indicated that they were considering opening the floodgates and using emergency authority to go above what they proposed to Congress in today’s consultation. The administration also has not ruled out potentially paroling thousands of Syrians into the United States. Below is a section of the Refugee Act of 1980 which lays out the process which should be happening right now regarding the “consultation” and subsequent final determination. Calling any lawyers out there to help decipher it! But, as I see it, both House and Senate Judiciary Committees are required to hold hearings! Here are the sections I’ve selected for your consideration. I doubt most of this ever happens! humanitarian concerns or is otherwise in the national interest. anticipated allocation of refugee admissions during the fiscal year. in the allocation of admissions among refugees. Congressional Record the substance of such consultation. the details of the proposal would jeopardize the lives or safety of individuals. “(1) A description of the nature of the refugee situation. demographic impact of their admission to the United States. admit and assist in the resettlement of such refugees. designated representatives of the President with such members. Where is the report? Was it delivered two weeks ago? Contact members of the House and Senate Judiciary Committees (listed here) and tell them to hold PUBLIC hearings on the President’s plan! It would be preferable to hold field hearings around the country in some of the largest resettlement locations in the country so that citizens who will be most affected by large numbers of Middle Eastern and African refugees could be heard. If those hearings hold up the official beginning of the resettlement year—October 1—so be it! Note to Presidential candidates, this may be the most important issue America ever faces! This is the third in a series of primers of sorts for the media on the present Refugee Admissions Program. The first two are here and here. I wish I knew how to make one of the those flow chart things, but since I don’t, here is a list of who is responsible for which refugees are resettled in the US and ultimately where they are resettled. At the top of the pyramid is the UN High Commissioner for Refugees. The present UNHCR is Antonio Guterres the former Socialist President of Portugal. UNHCR Guterres and Asst. Sec. of State Richard. LOL! 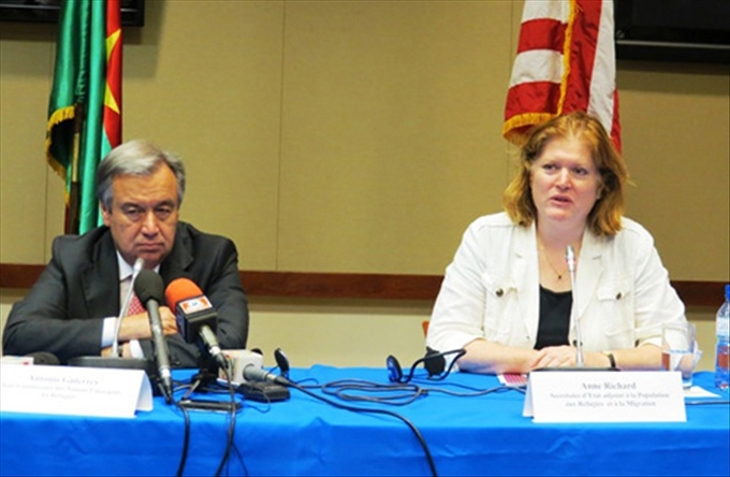 is this how Guterres looked when he heard about the FBI testimony and learned that the US can’t resettle the 9,000-10,000 Syrians he wanted us to “welcome” this year? Then next is the President of the United States who sends a determination letter to Congress each September which contains a ceiling for the number of refugees to be admitted in the upcoming fiscal year (fiscal years begin on October 1 of the preceding year, thus we are nearly 5 months into FY2015). The President also sets ceilings for various regions of the world. The ceiling for FY2015 is now at 70,000. Supposedly Congress can change what the President wants, but as far as I know no one on the House or Senate Judiciary Committees ever says boo! about any of it. BTW, the determination letter is prepared in the US State Department after what amounts to phony hearings where they say they want public comment on the “size and scope” of the program for the upcoming fiscal year, but they really only listen to their contractors (see contractors below). In the House of Representatives, the present chairmen of the House Subcommittee on Immigration and Border Security (of the House Judiciary Committee) is Rep. Trey Gowdy. In the Senate, the present chairman of the Senate Immigration and the National Interest Subcommittee (of the Senate Judiciary Committee) is Senator Jeff Sessions. Both the House and Senate Homeland Security Committees are involved too. US State Department where the Asst. Secretary of State for Population Refugees and Migration is Anne C. Richard. Under Ms. Richard are Lawrence Bartlett (in charge of bringing refugees in) and Barbara Day (in charge of working with contractors to distribute them around the country). The Department of Homeland Security is responsible for screening refugees. At the USCIS, Barbara Strack is the chief of the Refugee Affairs Division. And, finally in the Department of Health and Human Services the Office of Refugee Resettlement, which basically acts as the distributor of money to refugees and contractors, the new director is Ken Tota. I should mention that there are State Refugee Coordinators which have varying amounts of power depending on which type of Refugee program is being carried out by the contractors. Here is a directory of those contacts. Then ostensibly under all those layers are the nine major resettlement contractors, but LOL! it is often said that they are in fact running the show! They call themselves VOLAGs (short for Voluntary Agencies but they are paid mostly from the US Treasury). There are 350 subcontractors under the nine biggies who are resettling refugees in your towns and cities. For reporters focusing on your own cities or states, here is a link for a directory of subcontractors in almost every state in the nation. Do you see the abbreviation in the left hand corner of each listing? That is the abbreviation for which of the nine biggies that subcontractor is affiliated with. Here is a map of the US showing where those subcontractors are located. In response to our post earlier about the unhappy Bhutanese refugees in America, commenter CW suggested we establish a fund to repatriate them. This idea was one I thought about when a lot of Iraqis who came here a few years ago were so unhappy. I advised some to contact the Iraqi embassy in Washington to see if the embassy could finance their way home. Gives me an idea! How about we apply to the State Dep’t for grant to establish Repatriation Services? Sort of like a revolving door: Catholic Charities brings them in, and Repatriation Services escorts them out! RS also could take all those poor illegals who “were brought here through no fault of their own” and repatriate them, too! For those of you who say this would be expensive, I say, no it wouldn’t! It would be cheaper to provide a plane ticket and maybe a little start-up money then to provide years of social services (including the mental health services the unhappy Bhutanese are requiring). By the way, the Bhutanese are really Nepali people, so we might work a little deal with Nepal (a little foreign aid perhaps) to take them there. (I wonder what we are paying the countries who are taking the Guantanamo prisoners—a bundle I bet!). Do you know that right now, the refugees who are flown here are loaned the airfare money and must begin paying it back almost immediately. The contractors do the dunning letters and the collecting and get to keep a cut for themselves. Thus it is almost impossible for an unhappy refugee to ever gather the necessary money to buy their own ticket home. Come on Congress, how about a Repatriation Fund and a little start-up money! For more Comments Worth Noting, go here. Where in the USA are the refugees and the resettlement offices? 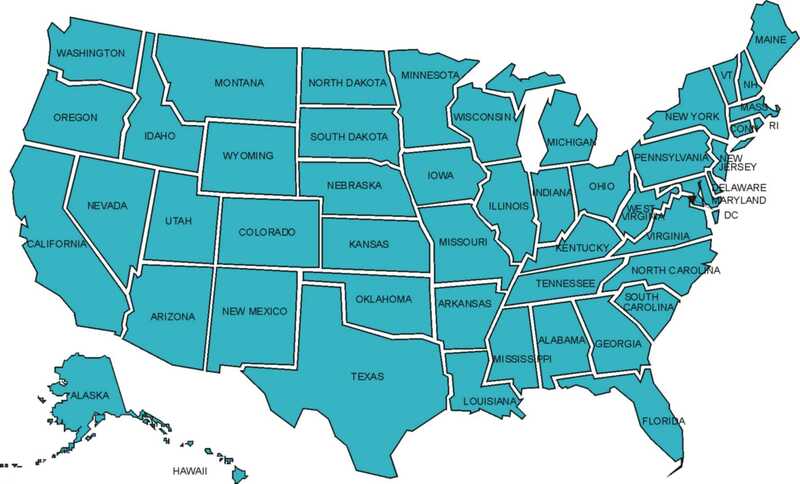 I just came across this very useful map for FY2013-2014 at the Office of Refugee Resettlement (HHS) to help you research what is happening with the Refugee Resettlement program in your state. When you go to the site and click on your state, all of the federal money flowing there is available as well as a list of locations where refugees are resettled with names and contact information for those doing the resettlement. I can’t emphasize enough how important it is for you to learn about the program where you live. I know it’s an overused expression, but knowledge is power. And, that is why we started this blog in the first place to help you gain that knowledge. Click here for ORR’s interactive state map! (When you look at the map, you might want to go here for information on what a Wilson-Fish state is). In 2013, ORR Director Eskinder Negash, announced the creation of Regional refugee resettlement offices to coordinate state offices. At that time there were regional refugee offices located within five of the ten Administration for Children and Family (ACF) offices. ORR will open up to five regional offices in Atlanta, Chicago, Dallas, Denver, and San Francisco (and potentially additional regional locations). Click here to see the ten ACF regions and regional headquarters.